Ubaidullah Evans is IMAN’s Scholar-in-Residence. He is currently completing his studies at Al Azhar University and periodically delivers khutbas at IMAN, as well as leads an annual series of reflections during Ramadan. There are a lot of reasons to love the American Midwest. However, breathtaking scenery full of alternating types of natural beauty isn’t one of them. The camaraderie and bonding fostered by road trips aside, when I learned I would be traveling by car with a small group of IMAN staff to Detroit and Saginaw, Michigan for a series of community events, I didn’t expect much from the journey. Topographically, the Great Plains are, well, plain! 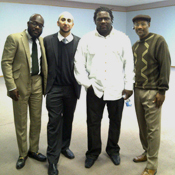 This trip was about Detroit and Saginaw and their respective Muslim communities. The fact that rivalry exists between Chicago and Detroit is hardly lost on anyone; just pick up a newspaper on the eve of a Chicago vs. Detroit sporting event! Yet, upon comparison, what may come as a surprise to many is the way ‘The D,’ as my friends and I affectionately referred to the Midwest’s Second City growing up, holds its own in the shadow of a bigger, and it can be argued, culturally more important city in ‘Chi-Town.’ And while one can certainly count the perennially pivotal role of the American automotive industry in the world economy, Berry Gordy’s iconic Motown record label, or even the three consecutive NBA playoff drubbings the Detroit Pistons “Bad Boys” issued the Michael Jordan-led Chicago Bulls throughout the late eighties and early nineties as examples of Detroit’s influence matching or outstripping that of Chicago, I had something different in mind as we set out on the road. Both illuminating conversations with pioneers (the early converts to Islam and proto-Islamic movements who make up the First Resurrection) and some academic literature on the subject point to Detroit as the true Mecca of Islam in America . And though it may be said that Chicago is one of its most important ‘Medinas,’ visiting Detroit does make for an interesting bit of historical perspective. On Saturday morning, after finishing an appetizing breakfast at the home of one of our gracious hosts in the nearby suburb of Dearborn, we began to make our way into Detroit for a fundraising luncheon. The streets of Detroit revealed most of the maladies plaguing America’s urban centers writ large: the disappearance of jobs, urban decay, rampant foreclosures, the inaccessibility of healthy foods, etc. The heightened visibility of these pathologies in Detroit lent the luncheon we attended to raise funds for the establishment of the Muslim Center of Detroit health clinic a special kind of urgency. Located at the site of the future clinic, in the heart of an affected, inner-city neighborhood, the Muslim Center fundraiser represented a diverse collection of Muslims’ desire to make a difference in areas often neglected by others. Although the host community was the predominately African American Muslim American Society (MAS)—formerly under the leadership of the late Imam Warith Deen Mohammed—the attendees represented many different ethnicities and religious orientations. Beginning with our stately M.C., an older black woman, each speaker that took the stage referenced the Islamic ethic of community service, and the precedent of our beloved Prophet Muhammad (sallallahu alayhi wa sallam). The unifying force of Islam was in full flower on that afternoon. As the affair drew to its climax and the actual appeal started I was amazed by the generosity of the attendees. Unemployment, falling wages and property values, and social slippage have exerted their influence on the Muslim community like everyone else. Yet, the pressing need of providing high-level healthcare to the uninsured and underinsured was highlighted in a compelling appeal which moved many of those in attendance to ‘dig a lil’ deeper,’ and I think the fundraising wound up being highly successful. We capped off the afternoon by taking a guided tour of the clinic. Briskly strolling through the vacant rooms of the newly proposed clinic, we were a portrait of smiling faces and nodding heads. I think there was a sense that we were on the cusp of a new wave of Muslim investment in America; one that seeks its returns in positively affected lives as opposed to monuments. Contributing to the health and wellness of the most vulnerable members of our community represents the finest traditions of Muslim civic-mindedness and engagement. It not only draws upon a longstanding tradition of philanthropic endowments and free hospitals that have existed in the central lands of Islam from our Golden Ages until present, but is also in direct alignment with the spirit of community service and social relevance that introduced Islam to America. Detroit is still holding its own! This entry was posted in News and tagged Detroit, Ubaidullah Evans by IMAN Staff. Bookmark the permalink.